As part of BJGE LLC’s continued efforts to help educate clients by offering “Helpful Hints”, Azeezaly S. Jaffer is pleased to announce a series of articles by Jenny Wise on Making the Home Safe. The first in this series is “How to Make Your Child’s Bedroom Autism Friendly”. Every child deserves a bedroom where they can be safe and feel at ease. For children with autism spectrum disorder, a well-designed bedroom is especially important to provide them with security and a place to retreat to when overwhelmed. From promoting calm to supporting the senses, here’s where you can get started. Your little one’s bedroom must be a refuge, somewhere they can be relaxed no matter what’s happening. A central part of this is the careful use of color and decoration, which will not only help manage moods but also support focus and learning. Choosing the ideal hue is a process, and you should defer to your child’s preferences, but there are several recommended colors. For example, soft and neutral colors are suggested to calm children while many consider blue to be an effective sleep aid. Of course, you may still want an area of the bedroom for when there is a downturn in mood. It doesn’t have to take up a lot of space and could simply feature a few favorite toys, pillows, and stuffies, or whatever provides happiness and calm. Clutter is not easy on anyone, but for those on the spectrum, disorganization can be extremely upsetting and a source of overstimulation. While you develop the bedroom, think about how you might structure it to accommodate a system that encourages tidiness, and instills a reassuring predictability. As an example, make use of transparent storage so that your little one can see what is inside, and label boxes or use color coding for added clarity. You should group similar items, such as toys and learning materials, to further their bedroom’s organization and give them comfort knowing that their things have a set place. 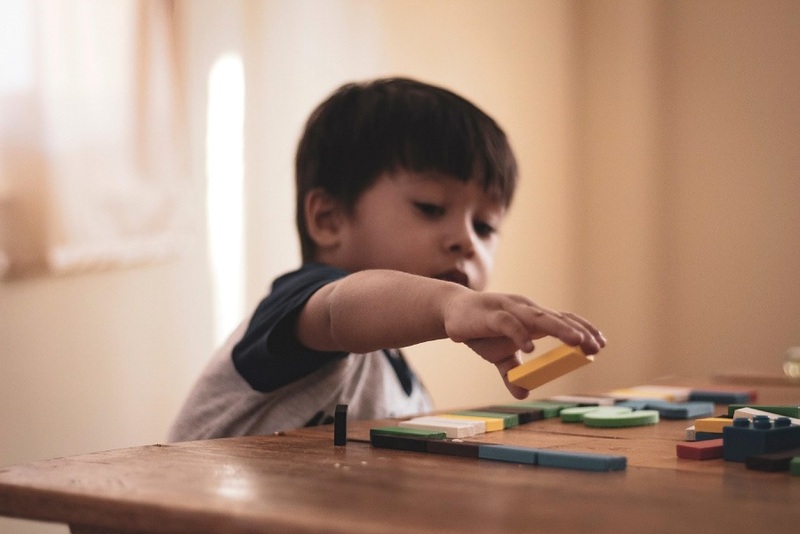 There is a broad variation in how autism manifests symptoms, and that can be apparent in how sensitive a child is to noise, sight, smell, and touch. You will have to tailor their bedroom to any sensitivities to manage overstimulation or unease, such as avoiding harsh lighting or certain fabrics, but their established preferences can guide your choices. If they have shown comfort with a particular item of clothing, you could adapt those textures for use in their bedroom. Just like clothing, don’t force the issue, as this will do more harm than good. Instead, offer choices, if practical, to invest them in controlling the textures around them. Not every child with autism has difficulty sleeping, but there are options that can help improve mood and behavior. For instance, some on the spectrum are comforted by feeling cocooned, so consider weighted blankets or sleeping bags to produce that sensation. Their environment should also be buffeted against any sensitivities they may have, such as using a noise machine to cancel out distracting or unpleasant sounds or putting in blackout curtains. With the right tools and strategies, you can give your little one a sleep sanctuary. When planning out furnishing choices, your first thoughts will be towards functionality over aesthetic, and the unique requirements of your little one. After all, something like a vase on a table or a mirror may not seem dangerous, but they could be if toppled. You might want furniture, even wardrobes, that are securable using something like an L-bracket and may need to forego handles altogether if there is a tendency to climb. However, safety considerations allow for some creativity, as glass mirrors can be replaced with acrylic alternatives, and you can even sketch a headboard onto the wall to have the look without the risk. We want only the best for those we love, and for the family home to be a haven. By designing a bedroom that is autism-friendly and supports the needs of your child, you can achieve that. Give your precious one a place where they feel safe, and where their personality can always shine. With Spring finally here, now is the perfect time to renovate or refresh the the home. A few tips to get you started.